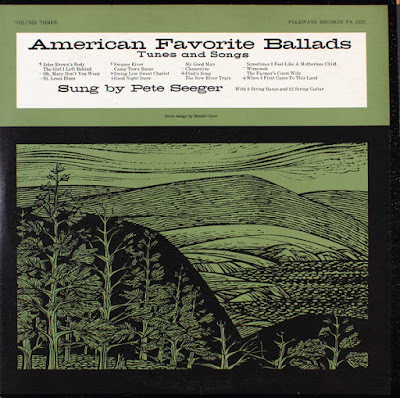 Having recorded two volumes of "American Favorite Ballads", Pete Seeger still had many familiar American folk songs to choose from in assembling a third volume. Yet he (or Folkways Records producer Moses Asch) seems to have expanded the concept of what songs were acceptable for inclusion. Maybe that explains this album's subtitle, "Tunes and Songs", which would seem to cover just about anything. Beginning with the pre-Civil War tribute to the famed militant abolitionist, "John Brown's Body," Seeger also sings spirituals ("Oh, Mary Don't You Weep," "Swing Low Sweet Chariot"), blues (W.C. Handy's "St. Louis Blues"), and minstrel songs (Stephen Foster's "Swanee River" and "Camp Town Races"), along with more traditional folk fare. He also presents a banjo instrumental ("The Girl I Left Behind Me"), and he draws from the repertoire of the group from which he has now departed, including his solo versions of the Weavers' "Goodnight Irene," "My Good Man," and "Wimoweh." The last selection is perhaps the oddest in the set, first because, as Seeger freely acknowledges, it comes from South Africa, not America. (Of course, having been a U.S. pop hit, it can rightly be called an "American favorite," anyway.) The second curious aspect of its inclusion is Seeger's evident discomfort in singing it by himself. He begins as if he's conducting an instruction record on group singing, telling listeners how they can join in on the recording and acknowledging that the song will sound odd with only his solo part. Then he sings his solo part. This may not be a Seeger live album, but even alone in the recording studio, he expects an unseen audience to sing along on one of his greatest hits, American or not. Thank you for sharing Pete Seeger...appreciated. Glad you are interested. Best wishes!